I’ve loved scheduling these Christmas giveaway posts. I’ve been tucked up in my mermaid tail blanket, complete with notebook and cup of tea, ready to take on the world. Anyone else feel like they can achieve anything with a notebook and a brew? Of course, having everything match makes my heart happy too. Check out these beautiful goodies from Glitter & Earth*. Glitter & Earth is run by Jacqueline Wild in Penzance, Cornwall. You can find their products stocked in Endless Spiral on Chapel Street and you can also order via Etsy. Jacqueline specialises in fairytale and folk inspired illustrations, with unicorns and woodland creatures popping up in her work too, including greetings cards, jewellery and calendars. To be in with a chance of winning a mermaid mug and notebook, just complete the Gleam entries below before midnight Wednesday 12 December. A winner will be drawn at random and contacted directly. They will have a week to respond before an alternative winner is selected. UK entries only. So lovely. Having everything match makes my heart happy too. 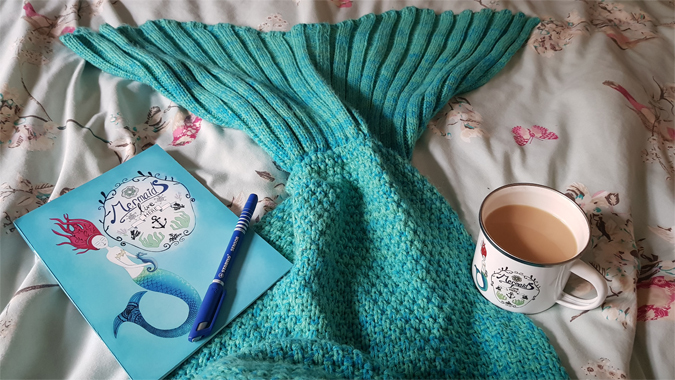 Santa has bought me a mermaid tail throw for Christmas so a mug and notebook to match would be perfect! !